Every quarter CollectPlus celebrates the very best in the UK by awarding the Store of the Quarter to a stand out convenience store. This initiative recognises the highest quality service and customer satisfaction taking place across our network of 7,000+ locations. Hidir Koc is the store owner behind the popular The Village Store in South Woodford, East London. This bustling heartbeat of the local community is the latest store to be awarded the prestigious convenience store award, with the store’s performance between October and December 2017 sending it to the top of the CollectPlus customer service leader board. 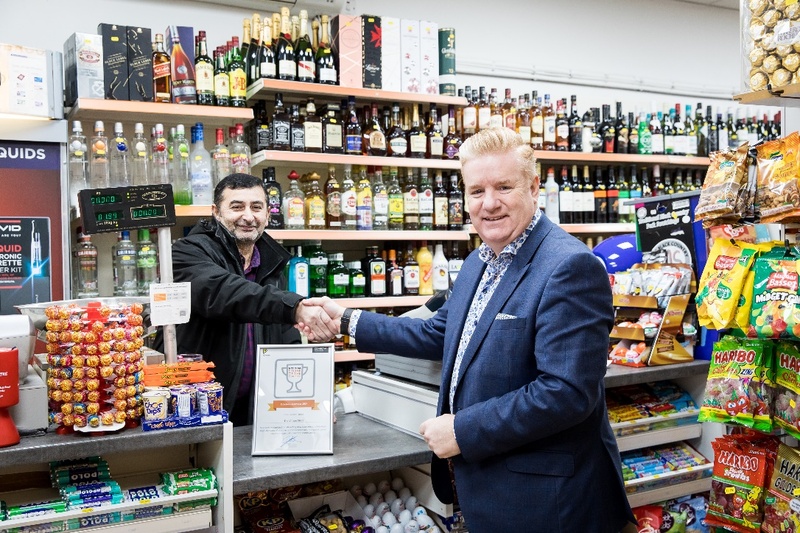 We caught up with the store’s owner, Hidir Koc, to find out more about his reaction to the award win and the store’s positive impact on the local Woodford community. Read on to discover what made this store so popular with customers during the busiest delivery time of the year. There are now over 7,000 newsagents, convenience stores, petrol stations and shopping centres in the CollectPlus network. How did you react to being named the UK’s best CollectPlus store? It was fantastic, my wife and I were so proud when we were told the news. We’ve owned the store for 15 years and have been a member of the CollectPlus network for at least five years, so it’s great to receive this award after being part of it for such a long time. Business can be slow, but the store always gets really busy with parcels in the build up to Christmas, especially across November and December. We are proud to receive this award as it’s proof that our hard work throughout the Christmas season really paid off. How has being part of the CollectPlus network changed your business? Having the CollectPlus service has been a real boost to the business and is a definite hit with commuters collecting parcels whilst passing through the area on their way to and from work. We’re pleased to have become a local delivery hotspot during rush hour, and its always the same time of day that the store gets busy in the evenings. We make sure we have an extra member of staff on hand to cope with the increase in footfall during these busy times. Thanks to the CollectPlus offering, we are now well-known in the area for these services. Being so close to the station has meant people look to us for their deliveries, rather than going to a bigger store. It’s certainly sets us apart from other local competitors. Did you have any stand-out store experiences this Christmas thanks to CollectPlus? We had a few customers come into the store who were anxious to receive their parcels in time for Christmas. We always comforted these customers and reassured them that their parcels would arrive, and it was lovely to see them come into the store to collect their parcels successfully. As we move into 2018, how do you see the store’s future looking? The Village Store is called ‘Village’ for a reason, as we want to keep making our customers happy with the reliable village feel of our store in the future. We are a family business and will continue to support our community for a long time to come. We also own seven other businesses in the area, including a new shop and bistro opening this year, so it’s a big year for the family. However, this is our only CollectPlus store so it’s a very important part of own business network and we want to continue to be a convenient delivery spot for anyone who needs us.